I’ve been waiting for a week and a half for my persimmons to ripen to the point of being jelly-like. This recipe is well worth the wait! 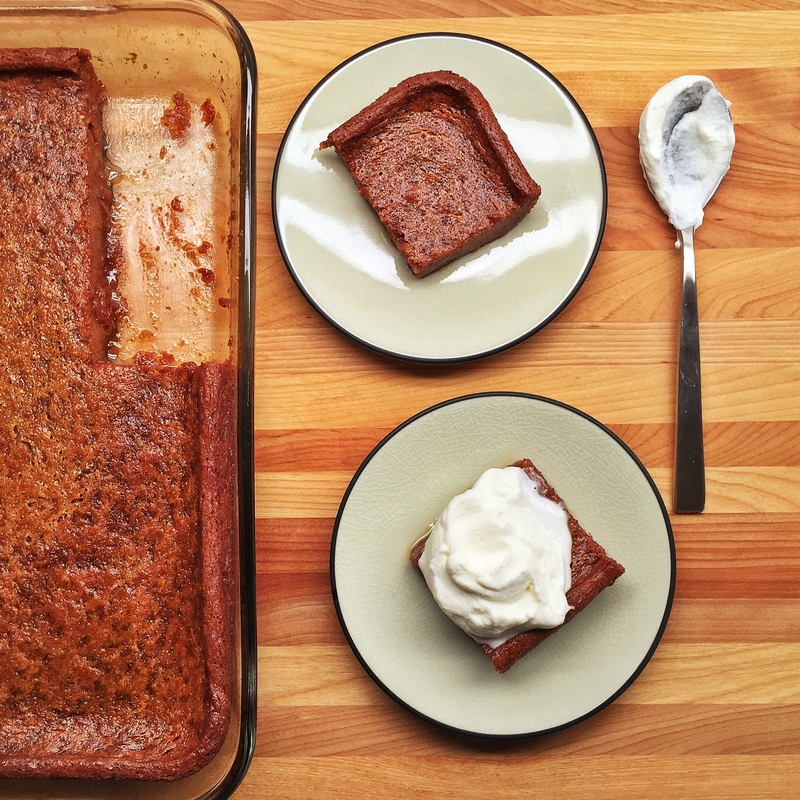 I didn’t grow up eating persimmon pudding (or persimmons for that matter), but I’ve loved this recipe since the first time I made it several years ago for a project at work. I’ve made a few changes over the years, adapting the recipe from several recipes at this point. This pudding is also a great alternative to pumpkin pie, and it’s a very simple recipe! 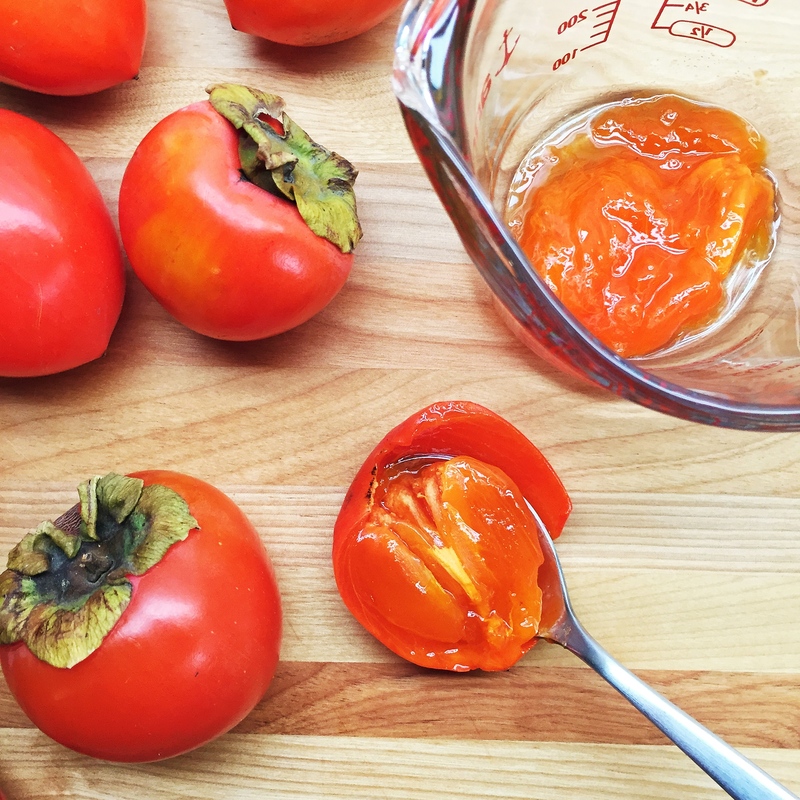 Be sure to use Hachiya persimmons that are VERY ripe, and remove any seeds. Preheat the oven to 350°. Butter a 9 x 13 baking dish. Remove and discard the stems of the persimmons and cut each persimmon in half lengthwise. Remove any seeds (there may be one or two). Scrape the pulp out with a spoon into a measuring cup. Continue until you have measured out 2 cups. 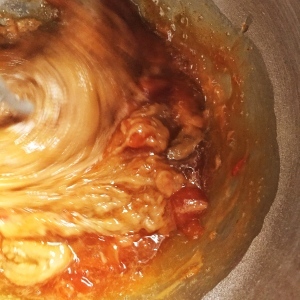 Mash the pulp with the back of your spoon if necessary to break up large chunks. 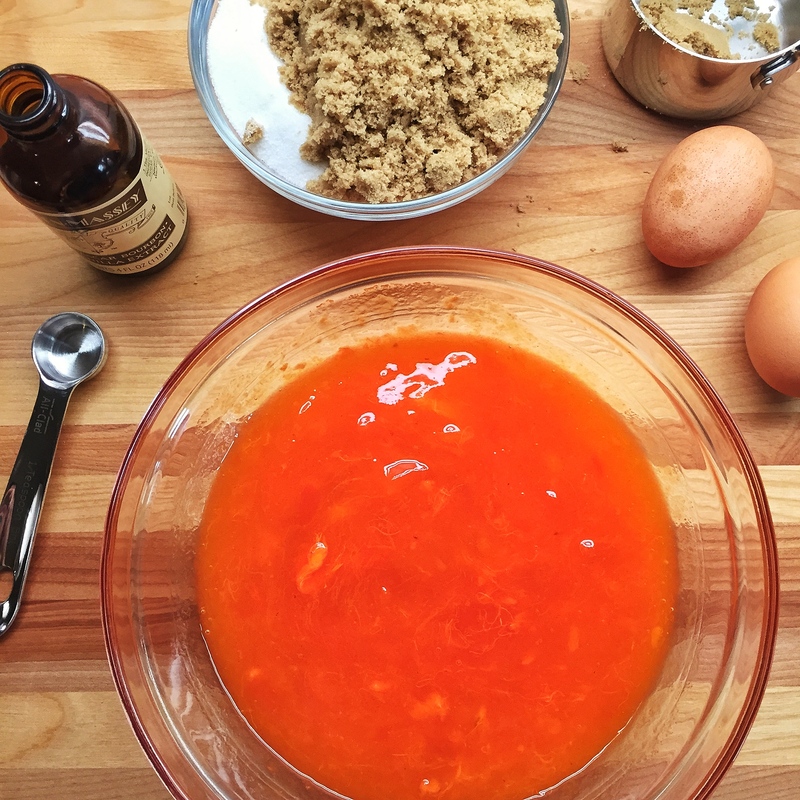 Combine the 2 cups of persimmon pulp with both sugars, eggs, and vanilla in a medium bowl. 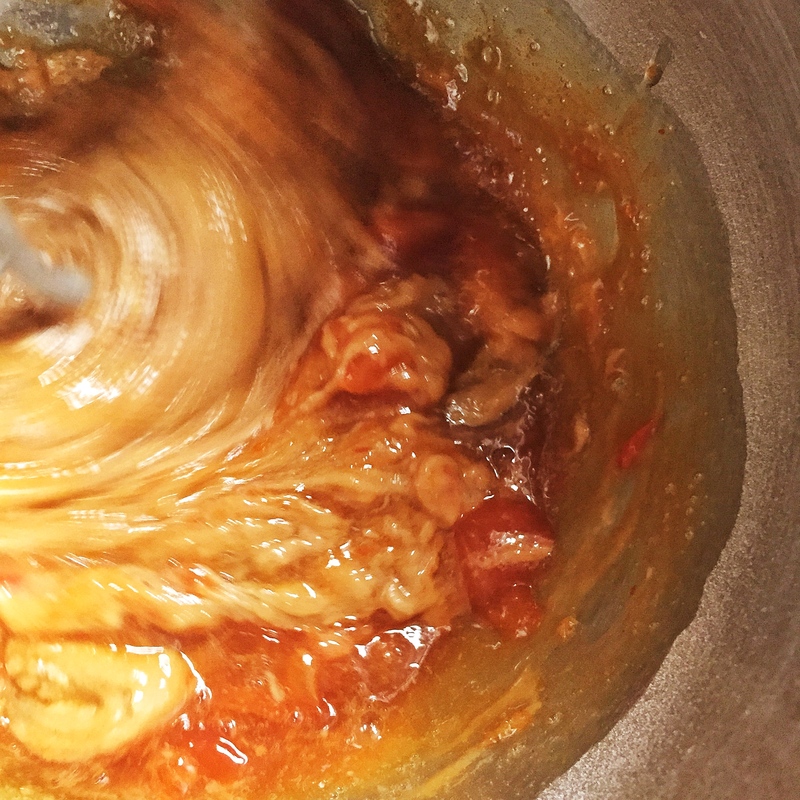 Into the bowl of a stand mixer, sift the flour, baking powder, salt and cinnamon. Whisk the buttermilk and baking soda together until foamy. 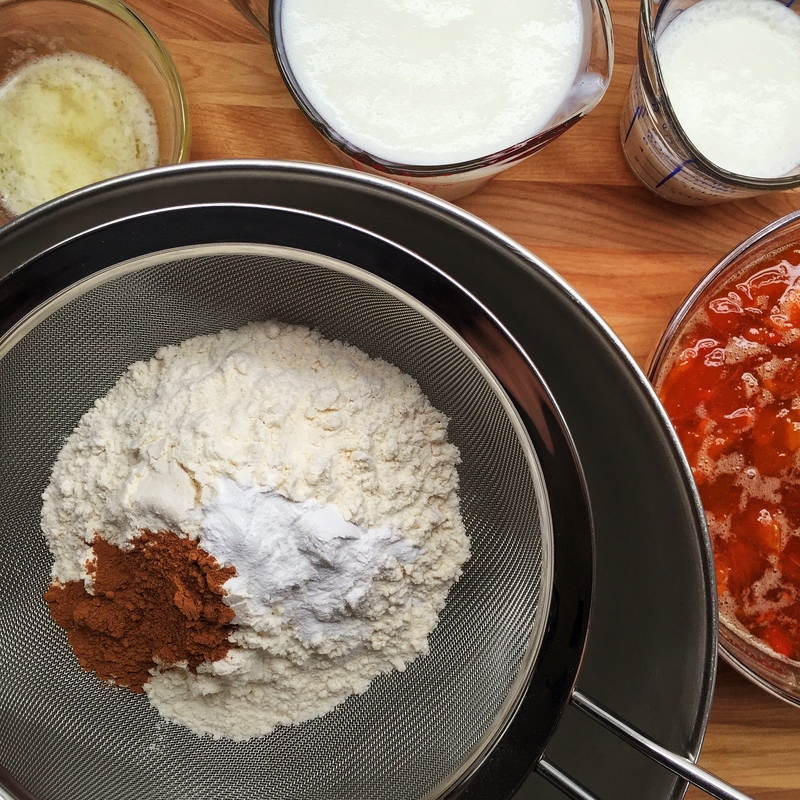 Add the persimmon mixture to the flour mixture, one-third at a time, beating well after each addition. Add the buttermilk/baking soda combo, heavy cream, and melted butter, mixing on low speed. Pour the mixture into the prepared pan and bake for 45-50 minutes until golden brown, slightly puffed on the edges, and a toothpick inserted into the center comes out clean. Serve warm with whipped cream. I look forward to more amazing food photos and inspiration on your IG gallery! I think I’m going to try making this around thanksgiving 🙂 Does whole foods usually have these kinds of persimmons? Once they are to the desired ripeness, could you take the pulp out and store it in the fridge for a couple days if needed? I’m concerned it will be challenging to buy these and get them ripe on the exact perfect day. I saw some at Whole Foods and Rainbow just the other day! I would go ahead and buy them now (they took nearly two weeks to ripen in a bag with an apple!). Once ripe, you could freeze them whole, or scoop the pulp out and freeze the pulp. 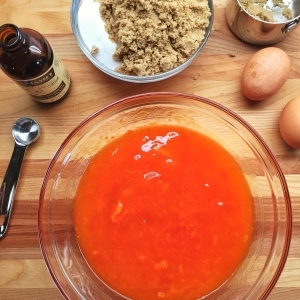 Some people add a little lemon juice to the pulp when freezing it to keep its color, but I don’t think it’s necessary since you are baking with them. I’ve also heard of freezing them when they are hard, and once you defrost them they will be mushy, but it seems like letting them ripen naturally would develop more sugars. Hey Lilian, my Dad and Mom pick their persimmons in large batches and mash the pulp lightly in a blender and freeze it in mason jars. They take it out when needed to bake with whenever they need. It’s always good! Hi Penny, I’ve been looking for a good recipe to use up my ripe persimmons and I think I have found it here. A good tip for ripening them faster is to keep them in the plastic produce bag, add an apple, tie the bag securely and put the entire thing in a brown bag and also stapling it shut. It will only take a couple days to ripen as opposed to two weeks, just remember the key is in using both plastic and brown paper bag ??? ?